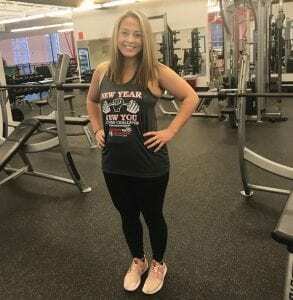 Briana Profitt, 29, recorded the highest weight loss percentage during the 2018 challenge. What started out as a New Year’s resolution has turned into a lifestyle change for Briana Profitt. The dental hygiene student from Neon signed up last year for personal trainer Brandy Cook’s 12-week fitness challenge at the Letcher County Recreation Center. It was January 1. Briana’s daughter Meredith was nine months old and she wanted to lose weight she had gained during pregnancy. At the end of the 12-week challenge, Profitt lost 25 pounds. Of more than 80 people who completed the challenge, she had the highest weight loss percentage of 12.69 percent. Profitt continued attending Cook’s classes, which follow the High Intensity Interval Training (HIIT) format in order for attendees to burn the highest amount of calories in the shortest amount of time along with decreasing body fat. She developed friendships with some of her classmates and ran her first 5K, 8K and 10K races. She also changed her eating habits. She now eats lots of fruit, vegetables, fish and chicken. Profitt says exercising is empowering and clears her mind. She speaks highly of Cook and how she played a roll in her fitness journey. “She is so motivational,” she said. Profitt is assisting Cook with this year’s “New You in the New Year” challenge by motivating and demonstrating modifications of exercises to beginners. Profitt said people who complete the 12-week challenge will be surprised with the results. Profitt says that everyone has bad days and urges them not to get discouraged. She recommends finding an exercise partner who will encourage and provide accountability. “If you have an off day, you just have to look forward and keep moving,” said Profitt.